Buy 3 or more for $8.99 each. 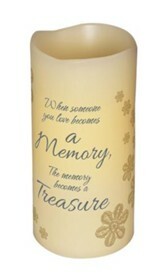 Flickering LED flameless candle is scented with vanilla and created to look like a natural wax candle, with irregular edging and real wax finish. Lace floral design with sentiment. 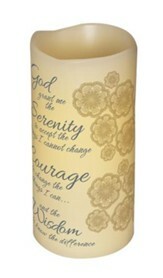 Yellow flickering LED inside is battery operated, safe and convenient; with built in automatic timer that runs 6 hours on and 18 hours off; mess free option for home lighting. 6" x 3". 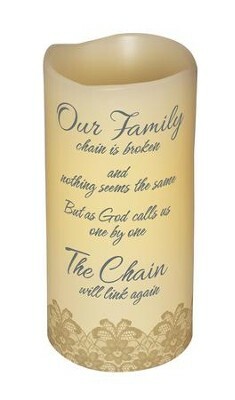 I'm the author/artist and I want to review Abiding Light LED Candle, Vanilla Scented, Our Family Chain, 6x3.